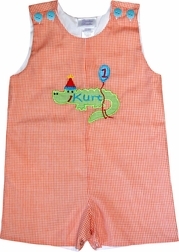 We found this cute, cute little alligator celebrating his birthday and knew we just had to put him to use for us! He was so excited to help other little boys celebrate their birthdays! The outfit is available as a John John, longall or white short sleeve shirt with shorts. The John John and longall are made from your choice of gingham or seersucker fabric. 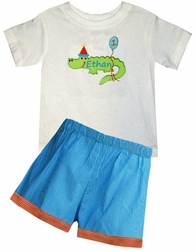 The shorts are also made of the fabric you choose but are accented with a fabric cuff to match the color scheme of the alligator. 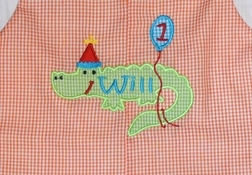 On the front of the shirt/outfit, we applique Mr. Alligator with his birthday hat and balloon wrapped around his tail. Your little one's birthday number/age is embroidered in the balloon. 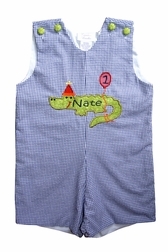 Mr. Alligator is monogrammed with your little one's name.